The elves of Solduron have long known the dragon Deathcloud sleeps somewhere deep in the Whispering Forrest, but for decades none have seen her. That all changed three days ago when Deathcloud appeared and destroy an elven outpost. Now the elves need heroes to journey into the Whispering Forest, rescue captive elves, and put an end to Deathcloud once and for all. 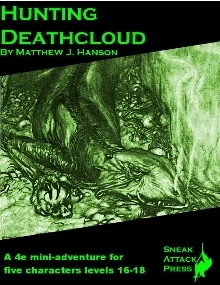 Hunting Deathcloud is an adventure for 17th-19th level characters. It is set in the Whispering Forest, an ancient woodland that can be dropped into nearly any setting. 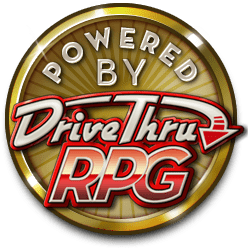 You can run it either as a one-shot or as part of a greater campaign. Also availalbe as part of the Sneak Attack Adventures bundle. "I have to say that I am really impressed with Hunting Deathcloud by Sneak Attack Press, and I think it is a great example of how to put together a very exciting high level adventure." -Neuroglyph, EN World's official reviewer. Read the full review. This title was added to our catalog on February 07, 2011.